Every time you plug an iPhone or iPad in to charge, it sounds a fairly loud chiming sound effect (unless it’s not charging anyway). One strategy to make the iPhone or iPad hush when plugged in is to place the device into silent mode by muting it with the physical mute switch, but that will still cause the iPhone or iPad to buzz. What if you want to completely silence the iPhone or iPad when it’s initially plugged in to charge? What if you want no buzz, and no sound effect when it’s plugged-in? That’s what we’ll show you how to do here, and it’s surprisingly easy with a simple trick. That’s it, super simple and the iPhone or iPad will start to charge without making any chime sound effect or any buzzing sound. It’s completely quiet. You can still determine the device is charging by looking at the little lightning bolt logo in the iOS header battery icon, the battery percentage indicator will continue to work as expected. Of course this is intentionally muting the sound, and the charging sound effect or buzz is generally a good thing because it indicates a device is properly charging as it should. 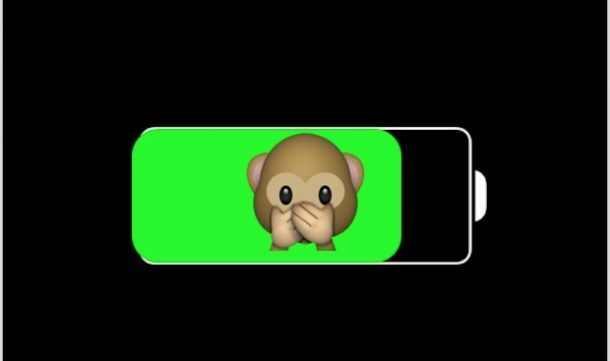 If it’s not and you didn’t use you this trick, you’ll want to fix an iPhone that won’t charge by following some troubleshooting steps. Thanks to our friend Keir at MacKungFu for discovering this nice little tip. He also mentions you can use the same trick on an unlocked device by simply opening the camera app before you plug-in the charger to the device. Know another way to silently charge an iPhone or iPad? Let us know in the comments! Does not work on my IPad ! It works on iPhone to charge silently: open the camera then plug in the charge cable, no sound, then close the camera unless you want to use it. Just turn down the volume to one or two notches before charging. If, as most people do, do not have volume linked to alert tones, this method doesn’t work of course. If you are dumb enough to have volume and alert tones linked when you turn down the volume you turn down ALL ALERT TONES TOO!! Of course Volume and Alert tones are linked. What good is silencing the phone if the alerts still make noise? Please don’t pretend you’re smarter because your choices are different. Then you’re an idiot. Linking them means when you turn down the volume of what you hear you also turn down the volume of alerts, ring tones etc. So you turn it all the way down or close to it then you don’t hear your phone ring. No one but you does this. Ok, I’ll bite. How do you unlink volume from alert tones? Are you talking about the “Change With Buttons” switch? Settings-Sounds-Ringer and Alerts turn Change with Buttons off. This will keep your alert and ringer at the same volume as it is set in this setting and not be affected by the volume up down buttons. I have an iPad 2 and an iPhone 6s… and neither one of them has EVER made this sound when charging. Both of them are silent… either that or I’m going deaf! Me too, I hear no sound on iPad nor iPhone???? I have a recently purchased iPhone 5s (with iOS 10.3.3), and don’t know much about it yet. I tried plugging in the charge cable when it was asleep, and indeed it awoke and made the charging chime (or beep, or whatever). I put it back to sleep and tried swiping the screen in all 4 directions; nothing happened (no camera). I pressed the Home button once so the screen lit up, with the message “Press Home to open”. I swiped the screen, and found something different in each direction, including opening the Camera when swiped from right to left. Okay. So then, with the Camera open, I plugged in the power cable. It switched briefly to the opening screen (with a large battery icon), and made the same chime/beep. I couldn’t figure out how to close the Camera, so put the iPhone to sleep again, then awoke it, pressed Home to open, then opened the Camera app, and plugged in the power cable. The iPhone made the same chime/beep. However, when I turned the ringer off with the mute switch on the side (so the phone would vibrate rather than ring), then pressed the Home button once, and swiped the Camera from the right and plugged in the charge cable, it did not vibrate. Same when I opened the Camera app after fully waking the phone. So this tip works for me on an iPhone 5s, but only in vibrate mode; if the ringer sound is on, it beeps, camera or no. On my iPad Air, the beep sounds when the charge cable is connected, whether or not the Camera is open. So far as I know, the iPad has no Vibrate mode. On my iPhone 6+ w/ latest IOS, it still chimes when plugged in with camera mode on. :/ When put in silent mode however, camera mode prevents the vibration buzz. So the trick is half effective. Now we’re scraping the barrel a bit! If there are no tips worth sharing, then don’t bother. A bit obvious, perhaps – but on iPad, you can just leave the headphones plugged in. Where’s the trick in this! What’s the value of this? Simply nothing. I like the tips posted here, and I frequently share them on social media, but this really isn’t all that big of a deal. The sound isn’t really all that loud, so it’s not disruptive. Try sleeping next to it. If you put a wireless charger on your phone, the charging noise is quite disruptive. Works on both my iPhone 6S and iPad Pro. Thank you for the tip, some of the Apple sounds can be loud and annoying and it’s nice to be able to silence them so easily. Am I missing something? I simply turn the phone to silent with the switch on side of phone, plug in charger, then turn the volume back on with same switch. I promise my husband would disagree that the phone hardly makes any sound when plugging in the charger. No matter how soft the sound, when I forget to turn it off, before climbing in bed after he is asleep, it wakes him and he’s a bear. So I really try to remember to turn that thing off. Who buys and iPhone 5s in 2017??? Me too the sound of plugging the phone will sometime wake up my wife. Even when putting it in vibrate mode then plugging the phone, the vibration will also sometime wake her up. Up to now I was using an head phone plug that I had cut the wires, but that won’t work with the iPhones that do not have a headphone jack. Up to now the only other truck I knew was to start recording a voice memo, plug the cable, then stop recording, then discard recording. Really cumbersome. This trick starting the camera before plugging the phone works perfectly on my iPhone SE. Mine started doing this for the first time today. It’s also getting older, fairly full and was a refurbished one with huge memory. I thought it was screaming for attention as something was wrong! Glad/ relieved to know it was apparently just late getting the memo! I have the opposite problem – my phone has suddenly stopped making the plug in sound and I can’t restore it. David – same as you. Mine all of a sudden stopped making sound or vibration and would like to see it restored. Ideas?